Located in Jayanagar, its a tiny little street food shop that serves Maharashtrian food. My husband suggested this place and off we went to try it out. 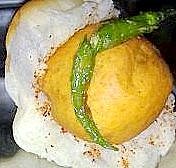 We had this long list of dishes we wanted to try and vada-pav was the first on it...The vada-pav that came was piping hot and spicy. The pav was fresh, soft and rightly toasted. The aloo-vada was perfectly fried with a hint of ginger and chilly. The accompaniments were chilly garlic chutney and this really tasty fried green chilly. The next on the list was sabudana-khichdi and shrikhand puris. Shrikhand-puri was an instant hit with my husband. Then came the poori-bhaaji which was pretty good (though a bit oily) and just when we were about to call it a day, I saw someone ordering a pav-bhajji and my eyes got bigger than my stomach so we ended up ordering it. Well the pav-bhajji was not exactly how I had expected it to be...not a disappointment but nothing like 'out-of-the-world' types. But yea all in all I liked the place and would definitely go there again!! Rajvardhan also sells some marathi spices and condiments such as onion-garlic powder, goda masala, peanut-garlic chutney, some pickles and some sweet 'n' salty snacks. Looks like I must visit the next time I am there :) nice blog dear!